Find out who is top cat in Top Cat. Level 1+ Songbirds Phonics books focus on matching one sound to one letter, for example o as in dog. 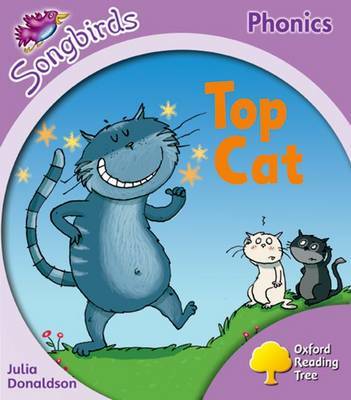 The focus phonics in this book are m c t p a o. Oxford Reading Tree Songbirds Phonics are highly decodable, beautifully illustrated stories written by best-selling author Julia Donaldson. The series contains a variety of storylines, rhyme, rhythm and genre ensuring there is something for every child to enjoy. The rich, patterned language in the stories is decodable making them perfect for children to practise their phonics. Songbirds Phonics can be used as a complete phonics programme, or the individual books can be used for phonics practice alongside any other phonics programme. Each book contains inside cover notes to support parents/carers with their children's phonics practice and comprehension.